Detects your VO2 max, recovery time, time in cardio area or cycling workouts for power. Compatible with rollers to workout with ANT +® Protocol for interacting with the "load" of training. Automatically detect the FTP data (Functional Threshold Power) ovverso the threshold of power, the watt/kg and the dynamics of cycling if used with a power sensor Vector or Vector 2. ¹ connectivity features: Live Track, Smart Notification, sending/receiving routes from Garmin Connect Mobile, data sharing via social media, show the current weather conditions. Edge 520 is the first GPS bike computer compatible with segments Strava6. It also includes a test version 1 month Premium Strava. You need a motivation to complete the last few kilometres on the reels during your indoor training? Edge 520 offers this innovative function when bound with ANT + Protocol. For example, if I wanted to train with an average power of 240 Watts, simply set the goal to Edge 520, start pedalling and the rollers adjust automatically depending on your goal. You can also follow a path created by another cyclist and download it from Garmin Connect, competing virtually against the athlete with which you want to compare yourself, because the rollers adjust pedaling strength according to the slope and altimetry data downloaded. Associated with a power sensor, Edge 520 will offer you another set of functions, such as FTP detection threshold power and Watts/kg, and the dynamics of cycling ². A threshold test of power built into the tool will help you establish your reference data to keep during your workout on reels or on the road. Associates the heart rate monitor ³ and 520 will calculate accordingly the esteem of your VO2 max and recovery time post-race, which indicates how long to wait before you can tackle a more challenging endeavor. Edge 520 doesn't compromise when it comes to the screen: 2.3 inch color resolution. We have optimized the screen so you can get the most out of view considering the compact size of 520. Enjoy also the sharpness of the screen in all lighting conditions. Edge 520 is compatible with ANT + sensors, including bike radar Ranges™ and bikelights Varies™4, speed, Cadence, heart rate radiocontroles Edge and VIRB ® and compatible scales. It also integrates with Shimano Di2 electronic shifting5 to display the current running on the screen. Edge 520 is also compatible with ANT + power meters, including the series Vector. When combined with a compatible phone and the app Garmin Connect ™ Mobile, real-time detection, Edge 520 offers warnings about the smartphone, social media sharing, weather and wireless uploads. 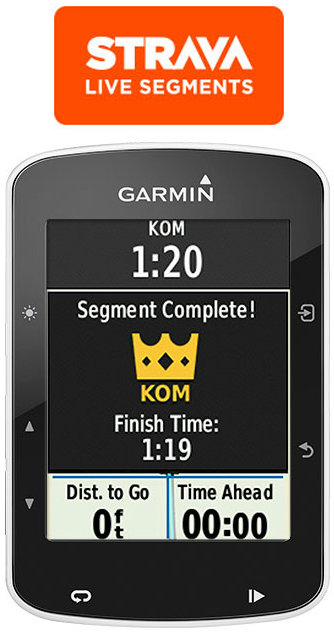 Once running, the data can be automatically sent to Garmin Connect™, our online community where you can save, plan, and share your racing on bikes. Rugged and compact form factor and battery life up to 15 hours of 520 Edge make it perfect for adventures off the beaten track. It is also compatible with GPS and GLONASS, to use other options of signal wherever you are headed. ¹ when combined with a compatible phone. ² If used with a power meter Vector or Vector 2. ³ included with some models, sold separately in others. 4 With a future software update. 5 Compatible with Shimano Di2 electronic exchange systems with data management function Shimano D-Fly.